Regardless of where you live – the United States , Australia , Europe or anywhere else – making the right treatment decisions is not easy for two reasons. First, it can be difficult to get the “bottom-line” on what conventional therapies can really do. Many oncologists use vague language when speaking with newly diagnosed patients about treatment efficacy (effectiveness) and toxicity (side-effects). Some are motivated to provide false hope while others simply do not want to admit that they have nothing to offer. The result can be patient confusion and a blind and undeserved trust in the doctors. The second reason that it is hard to make the right treatments choices is because orthodox doctors consider most alternative therapies to be unproven. The fact is that many herbs and other natural agents have been used for centuries to treat cancer, but the major drug companies have not tested them in patients because they are difficult to patent and less profitable. If large companies do not finance and publish research on a particular herb, vitamin, or treatment then conventional physicians consider the therapy “unproven” and do not take it seriously. When oncologists do not provide the truth about their therapies and when patients are discouraged or prohibited from using an alternative treatment that they believe in, the result is usually tragedy. This, I know from personal experience. My son, Alexander, was diagnosed with an aggressive brain cancer (medulloblastoma) when he was two years old. It was removed by two surgeries, but my wife and I were warned that, like mesothelioma, the cancer would return unless Alexander received further treatment. After considerable research, we found that the best treatment was offered by Dr. Stanislaw Burzynski, an M.D., Ph.D. in Houston Texas . This doctor uses a non-toxic natural therapy (antineoplastons) that had cured other patient’s Alexander’s age with the same kind of brain tumor. We took Alexander to see him and start the treatment, but the FDA said that he could not be administered this medicine. Because the treatment was not FDA approved, this bureaucracy required that Alexander first receive toxic chemotherapy and have his cancer return. Only after the cancer returned would the FDA allow him to be treated with this non-toxic approach. With no other options left, we reluctantly started a 12-month chemotherapy protocol at a highly respected Children’s Cancer Hospital . The oncologists there told us that this chemo regimen (CCG 9921) was “state-of-the-art” and would certainly prolong Alexander’s life if it did not cure him. Three months after starting chemotherapy, Alexander’s tumor returned, spread and took his life. He was only 2 ½ years old. After Alexander died in January 1999, I researched the treatment to find out why this had happened. I discovered that the chemotherapy that the FDA required that my son have was not FDA approved for children or brain cancer. I learned that one of the four drugs (cytoxan) was listed as a known human carcinogen (it actually caused cancer) and two others (cisplatin and etoposide) were listed as “probably carcinogenic to humans.” And worst of all I uncovered the fact that the same “state-of-the-art” chemotherapy protocol had been given to other children with the same cancer and it had worked so poorly that these hospitals had actually terminated the therapy – taking the children off these ineffective and toxic drugs soon after the protocol started. This had happened before Alexander was born, yet none of this critical information was shared with my wife or me. How was this possible? We never received an explanation from Alexander’s doctors why they left out such critical information, but other pediatric oncologists explained that “this was all they had to offer a two-year old.” In my work with other cancer patients, I can report that the use of half-truths is standard among some oncologists when conventional medicine has little to offer. As far as making the alternative therapy unreachable, the pharmaceutical industry has used its considerable lobbying efforts (it’s one of the largest in the United States) and bureaucratic clout (many FDA decision makers have worked for the larger drug companies) to protect its profits. Making alternative treatments offered by innovative doctors difficult to obtain is one example of an industry protecting its financial interests. For example, I uncovered the fact that the FDA bureaucrat who signed the order that made Dr. Burzynski’s treatment inaccessible to my son and hundreds of other children, worked for drug companies that marketed chemotherapy for children (both before and after his stint at the FDA). This FDA decision maker was financially connected with the very companies that competed with Dr. Burzynski’s non-toxic therapy. Such discoveries led my wife and I to be invited to testify before the United States Congress on June 7, 2000 (what would have been Alexander’s 4 th birthday). There, we explained to the Committee on Government Reform that patients should have the opportunity to use any therapy that may save their life and no institution, company or person should be permitted to stand in their way. My son’s story contains many tragedies, but for me two stand out. First, we were not informed about the real limitations of conventional therapy. If that information had been shared with us, we would have spared Alexander this toxic and ineffective treatment. He would not have spent his last months alive attached to an IV pole, walking the halls of the cancer ward, in pain, vomiting, turning white as a ghost, and being poisoned. Second, just because a treatment does not have the blessing of the “medical authorities” does not mean that it is bad, inferior, second-rate, or not to be trusted. The motives of these institutions and the people running them must be considered. Paul Kraus’ story is inspiring because he was successful in clearing both hurdles. First he immediately got to the bottom of the true effectiveness and toxicity of conventional treatments. Perhaps he was lucky that he had doctors who were willing to share the truth with him. Perhaps he knew which questions to ask. (He discusses in the book various methods for getting the most out of these consultations.) Based on what he had learned, Paul decided to reject conventional treatments because they would negatively impact his quality of life and not make a real difference in his survival. Second, as he describes, he pursued alternative therapies aggressively. He researched, read, spoke to other patients and worked with doctors and other practitioners who shared his philosophy and goals. He zeroed in on approaches and treatments that he felt could work. He reformed his diet, transformed his mental and spiritual outlook, and with the help of holistic physicians, discovered and applied treatments that were considered untested and unproven by orthodox medicine. While he did not have to deal with a government office outlawing certain therapies, he believed in and trusted the treatment protocol he created for himself (with the help of qualified practitioners) even when the protocol would be considered “unproven” and perhaps “crazy” by mainstream medicine. For me, Paul’s story is also inspirational because he accomplished all of this after being victimized. Often when someone is hurt by the maliciousness or negligence of another it can be difficult to break out of the state of mind of being a victim. Our morale is low, we may feel sorry for ourselves, and we have strong negative feelings. While these reactions are natural, they are not the strong, inner-focused, positive emotions of cancer survivors. One summer in the early 1960’s, years after these memos were written, Paul was a young college student. He decided to make some extra money by working in a chemical company. Nearby, workers were sawing asbestos fiber sheets. Day after day asbestos fibers in the form of a blue dust spun into the air and fell near Paul. Nobody cautioned him about this dust. There were no warnings or signs regarding the risk of cancer or asbestosis. Mesothelioma has a latency period of about 30 years and over the next three and a half decades the fibers lay in Paul’s abdomen, like ticking time bombs waiting to explode. 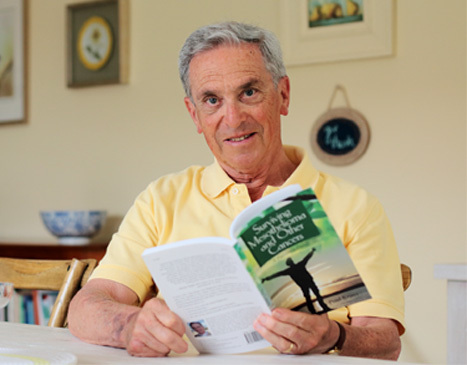 When the bombs “went off,” Paul was diagnosed with peritoneal mesothelioma and given a prognosis of a “few months to live.” Despite this trauma, Paul found the courage and inner strength to remain positive and take control of his life and his health. Experiences like Paul’s and my son’s demonstrate with great clarity that if you are diagnosed with an aggressive cancer it is critical not to allow circumstances or other people’s interests to control your health decisions. This means that even when you feel that life is crashing in around you it is important to remain clear headed and objective. For example, you should understand exactly what conventional medicine can and cannot offer. Oncologists may make the prognosis hazy. If you are serious about survival, now is not the time for vagueness or half truths! You want to know exactly how other patients with the same cancer did on the specific treatments being proposed. What was the average survival? The best survival? The worst survival? What were the side-effects? Did anyone die from the treatment and not the cancer? Can you speak to those patients who have survived? If your doctor is unable to provide that information, use Medline. Medline contains over 12 million citations and abstracts (summaries of research articles) from more than 4,800 biomedical journals published in the United States and 70 other countries. Medline is accessible from your computer via PubMed.www.pubmed.gov. Through Medline you can find out what has been published about thousands of therapies. – Treasure T, Sedrakyan A., Pleural mesothelioma: little evidence, still time to do trials . Lancet. 2004 Sep 25-Oct 1;364(9440):1183-5. This information is not encouraging. However, if you are serious about making the best treatment decisions possible you need the best information available. Next, if you are not impressed with what conventional oncology has to offer, learn about alternative therapies. Find qualified doctors who are innovative and not tied to convention. Ask these doctors the “hard questions” about their experience with your type of cancer. Also learn from other survivors like Paul Kraus. What did they do to beat the odds? And, if necessary, be prepared to confront anyone who tries to limit your treatment options. When your life is at stake, the interests and ignorance of other people should not get in the way of your right for self preservation. This is where courage and self-reliance become important.